Affordable- 77$ Exam and Adjust, 40$ Follow Up Visit. Insurance, Flex Spending, HSA Accepted. 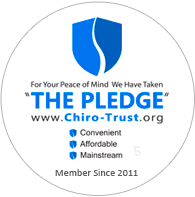 "To the best of my ability, I agree to provide my patients convenient, affordable, and mainstream Chiropractic care. I will not use unnecessary long-term treatment plans and/or therapies." "I have been a regular patient of Dr. Townsend for a number of years. He is methodical, nurturing and extremely personable. His pricing is very agreeable I STRONGLY RECOMMEND HIS SERVICES"
"Robert is a very affordable gifted chiro. The new location is great, plenty of parking, right across from Safeway. My adjustments last, and Robert is fine with me coming every once in awhile. I highly recommend him if you have any kind of back problems." "Rob, Thank you for your careful and effective individual care at reasonable prices. In the past I’ve been to other offices, but I prefer to have you “tune me up” as I need it, and at least every month just in case. I like your location on Grand Avenue. Glen"